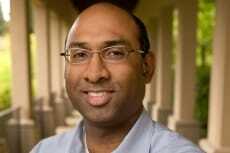 NYSCF – Robertson Stem Cell Investigator Dr. Ravindra Majeti, of Stanford University, published in Nature Medicine on his latest work studying genetic susceptibilities in acute myeloid leukemia. The researchers found that treatment success may be increased by identifying patients with a specific protein mutation and providing them with a gene-inhibiting drug. This type of research is exrtremely important in understanding why some cancer patients respond to treatment and others do not. In addition, it is the first step towards successful personalized medicine approaches to cancer and other diseases.